Effort is an expression of a deep desire in the soul. It is part of our process in this lifetime. We do not ride a bike the first time we try, and the same principle applies to our spiritual growth. I’ll say! 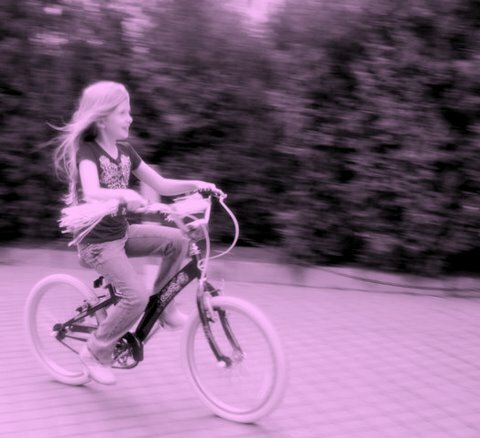 My first memory is just that…riding a bike. I absolutely loved my black and pink Huffy! Problem: learning to ride it truly was not easy and I have a scar to prove it. It just so happens that I fell off my Huffy into a pile of glass on the street which resulted in quite a bit of blood and a nasty scar on my right thigh. A second incident even earlier on (about 4-years-old) was from scaling a wall and trying to scoot myself from one side of a tall window to the other. Problem: I fell on a lovely, regal Spanish chair adorned by a metal peak. Ouch! You know how this ended…another scar. This experience, however, was even more memorable as it occurred during the Super Bowl. All of the surgeons at the hospital must have been watching the Bowl, since my father helped stitch me up in the ER! What was similar about these two painful moments was the fact that they indeed resulted from a deep desire and effort. I’m damn proud of my scars!! I recall that small window now as an adult, and say to myself “No big deal.” But as a 4-year-old that was a ginormous window and challenge. How cool for me to be able to get across! I was in another world in that moment, in a 4-year-old fantasy land, mimicking Super Woman! Yep, I love my scar! And my Huffy…that beautiful, tough Huffy, signified personal power, freedom and adventure! I explored many a neighborhood on that bike and found some creative sanctuaries along the way, like my favorite place I called “Paradise”, my own little spot under a bridge by a canal close by. Many of my childhood soul desires were dreamed-up there. According to Chinese Face Reading, an ancient form of Chinese Medicine, which I’m currently studying, thanks to the amazing Jean Haner, every single scar, discoloration, wrinkle, etc., on our faces reveals the specific challenges we are put on this earth to experience and learn from. All of them come from a deep place, and because they are all part of our earthly transformation, through our awareness of them we can grow in wisdom, self-compassion and self-acceptance. We also learn how to have compassion for others and accept them for who they are. Although the scars I’ve described above are not on my face, I’ve grown to appreciate my facial features and wrinkles (yay!) because I know they carry a deeper meaning. They represent ME and MY STORY! They also give me a clear picture of what lessons I still have to learn. What scars (visible or not) on or within you represent these important moments of effort and deep desire? How have they helped you grow and transform? This feels just like learning to ride a bike! It takes so many tries and so much effort to get there. I don’t know if I can do it! This situation or ones similar just keep coming up for me over and over. It’s like Murphy’s Law! This feels familiar, yet I’m ready to not re-live this. I’m ready to step over this invisible line I’ve drawn and say “No” this time. This comes up not only for me but for those close to me! I’m so darn excited! It’s like I’m in the flow and things are just magically happening! This is a sweet feeling! Are you beginning to notice what those Lovely Scars or deep desires may look like for you? Be curious. Look at your past and present experiences, and future desires for clues. The more you pay attention the more a pattern will become clear, making your spiritual journey so much more meaningful. I’d love for you to share some of your Lovely Scars…I hope you do.